Origin and Habitat: Orbea wissmanii is rather common in the highlands from Asir, Saudi Arabia to Dhofar, Oman and Yemen. Habitat and ecology: This species grows on bare rocky slopes often among boulders or under Commiphora and Anisotes shrubs. 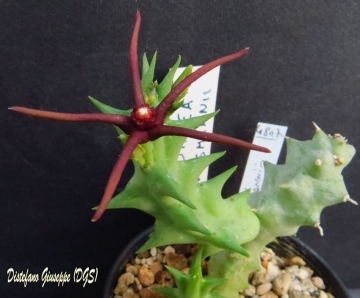 Description: Orbea wissmanii (formerly known as Caralluma wissmannii or Angolluma wissmanii) is a low growing succulent species with erect four-angled stems 7 cm tall, these pale and dark green dappled and soft-toothed. It spreads over the ground forming large crowded, cushions up to 1 metre across. The flowers are five-pointed fleshy stars produced in late Summer or Autumn, they are variable in appearance and range from brick-red to yellow, but are frequently bicoloured, with the base of the lobes being reddish, and which merges gradually into yellow on the the apical half. O. wissmannii is quite distinct from Angolluma baldratii (now Orbea baldratii), with which it had been widely confused in collections, by the other hand there seems little doubt that the formerly Angolluma meintjesiana is conspecific with O. wissmannii. Stems: Soft, erect or ascending, rooting from the bases, 4-angled, with soft- spinous projection at the angles. Surface smooth, light green, grey-green or dark green mottled with brownish or purple. Flowers: The pedicellate flowers are borne singly or in pairs (rarely more) in short inflorescences. Star-shaped, about 20-25 cm in diameter. Corolla lobes narrow, almost linear, 12-20 mm long and more than 3 mm wide, strongly longitudinally folded back, glabrous or covered with short papillae, mostly brownish-red at the base and golden-yellow to bright-yellow towards their apex, but very variable in colour. Corona bright yellow 3-4 mm tall x 3-4 mm in diameter. Buds narrow. Blooming season: This species produces numerous flowers simultaneously in late summer to autumn. Flowers exude a vague to intense smell of cat urine. This perfume attracts blow flies which are the natural pollinators. Following successful pollination of flowers pairs of seed horns are produced, packed with seeds attached to silky parachutes. Caralluma meintjesiana Lavranos: (= Orbea wissmannii) Flowers are fleshy stars with 5 narrow, linear lobes, mostly light green with a blood red centre but very variable. Distribution: Saudi Arabia, Yemen, Oman. Orbea wissmannii (O.Schwartz) Bruyns: Corolla lobes 12-20 mm long and more than 3 mm wide, strongly curved to touch each other behind lobe and lobes convex adaxially; yellow more or less suffused with red or red becoming paler toward apex, glabrous or covered with short papillae; corona 3-4 mm tall x 3-4 mm in diameter. Orbea wissmannii var. eremastrum (O.Schwartz) Bruyns: Corolla lobes 12-20 mm long and more than 3 mm wide, slightly folded back and lobes lightly convex adaxially; yellow suffused with red (sometime flesh-coloured) in proximal half, greenish yellow to yellow towards tip, glabrous or covered with short papillae; corona 3-4 mm tall x 3-4 mm in diameter. Orbea wissmannii var. parviloba Bruyns: Corolla lobes 9-10 mm long and less than 2 mm wide, pale yellow, covered with white hairs. Corona 1.5-2 mm tall,2.5 mm in diameter. Distribution: Yemen. Cultivation and Propagation: Orbea wismannii is an easy blooming plant when mature that require moderately watering through the growing season but enjoy plenty of water and some fertiliser in hot weather, this helps them to flower freely. Water more sparingly in winter according to temperatures. But, as with most asclepiads, it is unwise to leave them wet in cold weather. Winter care presents no problems at 5°C with plenty of light. 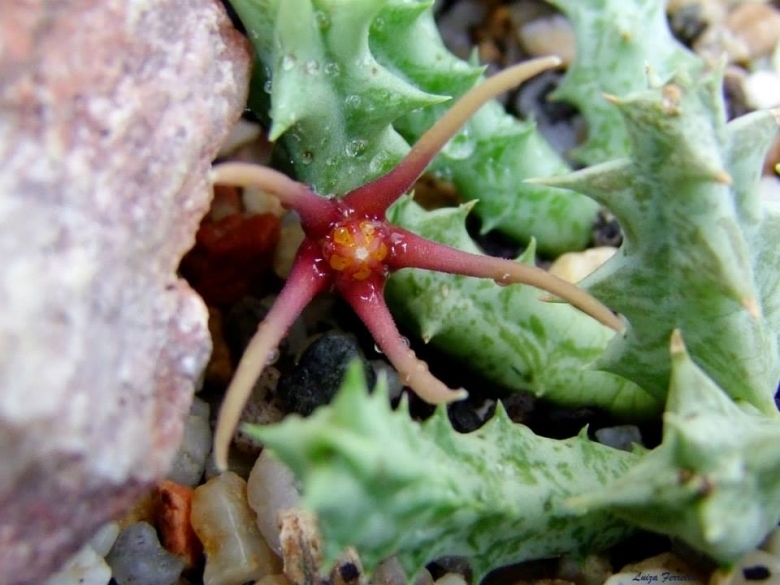 Since roots are quite shallow, use a cactus mix or add extra perlite or pumice to regular soil potting soil. A gritty, very free-draining compost is suitable, and clay pots help the plants to dry out between watering.